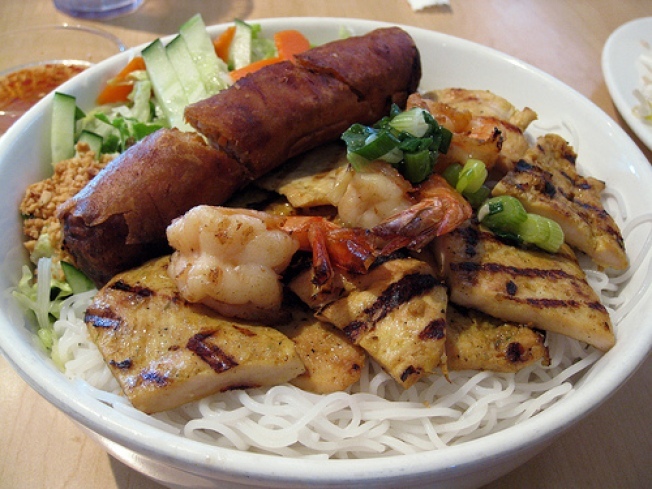 You can smell the grilled meat coming from Simply Vietnam before you even enter. Inside, the scent of basil, fish sauce, and coriander was the first thing that hit me when I walked into this casual eatery in Santa Rosa, popular with the office crowd during weekday lunches. Bun, or vermicelli-style noodles are among my favorite Vietnamese dishes, and so I went straight for that section of the menu. I usually eschew chicken in favor of beef, seafood, or vegetables, but this time I ordered the lemongrass grilled chicken and shrimp. The accompanying spring roll was crispy and piping hot, and I gleefully dipped it into my nuoc nam dipping sauce to cool it down. The shrimp was extra flavorful having just come off the grill and the chicken was good too, but on the dry side. And the noodles? I’m a sucker for noodles, and these had just the right bite to them. I can see why Simply Vietnam is such a popular spot for a quick lunch. Service is brisk, the food is remarkably fresh, healthy, easy on the wallet, and most importantly, delicious. Mariam Hosseini is a Bay Area native who has been writing about food and travel for six years. She blogs regularly at yogurtsoda.com.